It’s the latest in the long history of attempts to ground the “rise of the West” in slavery, colonies, and/or natural resources. I already criticised the productivity claim above in my earlier blogposts Baptism by Blood Cotton and Plant breeding…drove cotton productivity gains, but I have meant to address the industrialisation issue also. First I have a small detour. In The History Manifesto, Jo Guldi and David Armitage claim, in passing, that historians are fond of counterfactual logic, but it is foreign to the “theoretical toolset…that currently dominates corporations and policy”. But most people realise historians (trained in history) almost never engage in counterfactual logic at all. In fact, there’s a pronounced allergy to it. By contrast, every piece of economic analysis about the past, whether short or long, is implicitly or explicitly counterfactual. What was the effect of the increase in the statutory minimum wage ? What did the Fed’s quantitative easing accomplish ? How big was the impact of railroads on the American economy ? Sometimes there are natural experiments which permit tests, but very often they don’t exist. So each of those questions would be answered by comparing the actual world that unfolded with the hypothetical world where either the event did not take place, or in which a different factor might have been substituted. Robert Fogel, before doing his famous work on the economics of slavery, had cut his teeth by studying the impact of railroads. He modelled an American economy in 1890 that had not built railroads, but had instead expanded canals and other transport systems. Only by at least trying to answer such questions can you really begin to understand the impact of any particular event in the past. In fact, arguing that just because X happened, it must have been terribly important can be just as speculative as any counterfactual. After The Economist “withdrew” its review of Baptist’s book they kept the article on display but removed the hundreds of hostile comments the review had provoked. Several commenters acclaimed Eric Williams’s Capitalism and Slavery and condemned the lack of willingness to “come to grips with it”. But that had been done a long time ago ! Thomas & McCloskey, which was collected in Floud & McCloskey, has got a nice overview of the research from the Jurassic age of cliometrics on the importance of the West Indies in the late 18th century. The social rates of return on the British capital invested in the Caribbean sugar colonies were deliberately overestimated, but were still considerably lower than the returns from putting the same amount of money in gilts (British bonds). This was because the prices of imports from the British West Indies were higher for the British consumer than world market prices of the same goods, on account of the preferential access given to BWI producers by mercantilist policies. (Only ginger was cheaper !) Moreover, the British Exchequer doled out considerable sums to protect those islands from rival colonial powers. “…British national income would have been considerably higher ‘if the West Indian colonies had been given away'”. So all those people who now cannot see past the blood sugar riches in Jane Austen novels are revolted at private fortunes made at the expense of the British public. What does all that have to do with the cotton produced by American slaves ? Well, I think any counterfactual about cotton is less speculative than coal or sugar. First and foremost, there were ready substitutes for American cotton, as was proven by the “cotton famine” induced by the American civil war. At least from India, there was a fairly quick response to the “cotton famine”, which today would surely be called the “cotton supply shock”. India increased its production quite dramatically, and by 1865 Britain was able to import ~70% of its 1860 level from combined sources. The supply response must have been muted in the early years by the uncertainty of the war’s outcome. Beckert also makes a big deal out of British cotton merchants encouraging subsistence farmers (not slaves) in Pernambuco in Brazil to grow cotton for the British market. But the data above show the short-term elasticity of supply in Brazil was modest compared with India. Most of the global response to the American civil war should be interpreted in much the same way as fracking or ethanol becomes cost-effective only when conventional crude petroleum reaches a certain price. The USA, with its high yield, could supply more cotton at cheaper prices than India or Egypt, who could only supply more cotton at higher prices. The countries which sought to replace the lost US cotton were primarily expanding acreage by using new land or shifting out of other crops, not increasing yield per hectare. Of course by the 1880s the rest of Europe was a major consumer of raw cotton, and India began selling more to continental Europe than to Britain. Also, after the turn of the century, Japan industrialised with Indian cotton. But I don’t see any indication that the proportions for India, Brazil, and Egypt in global consumption were very different from the above. But of course in the absence of American cotton, Lancashire mills would have optimised their machinery to work with Indian and other cotton, which would have mitigated some of the disadvantages noted above. Logan reports plenty of testimony that British mills refused to retool their machines even though they could have worked more efficiently with Indian cotton, precisely because they expected the resumption of American supply and they feared losing their competitive edge against rivals like France. And the plant breeding experiments would not have sat still. Logan also reports the British East India Company, in the 30 years before 1860, had experimented with the humidity-adapted American cultivars in the more arid Indian cotton-growing areas and had achieved one small success by the 1850s, the “Dharwar American” variety. But then the Indian Mutiny/Rebellion broke out and in its aftermath the British East India Company was no more. Ultimately the improvement of Indian yields and quality depended on the local long-staple cultivar (Broach). So in the absence of American cotton there would surely have been an earlier, less haphazard, and more organised attempt to exploit India’s native resources. The government of the Bombay Presidency directly involved itself in cotton issues only during the US Civil War. Beckert also reports the wartime hyperactivity of textiles manufacturers’ associations in Britain, France, Germany, and Russia pressurising their governments to do something about cotton sources. A more realistic counterfactual would make American cotton available without slaves, under free labour. It is now well established, especially by Ransom & Sutch, that after emancipation ex-slaves were not willing to supply, under the prevailing wage, the same amount of labour as they had been compelled to do under slavery. The decline in labour supply was between 25% to 33%. I’m not sure if higher wages or better tenancy terms might have induced ex-slaves to work more, and, if so, why that did not happen. What ever the case may be, ex-slaves experiencing freedom chose a substantial substitution of leisure for work. But the point is, even after Emancipation, the American South could still meet at least 1/2 of the world’s demand for cotton. That just lowers the burden on the counterfactual. So even with all the disadvantages of Indian cotton, and even with the revealed preferences of emancipated American slaves, no reasonable person should imagine that western industrialisation would have ground to a halt in the early 19th century in the absence of slave cotton from the southwest frontier of the United States. The dramatic rise of America’s King Cotton in the half-century before the civil war was not an “absolutely necessary increase” for the end of the Age of Malthus. (*) Note : Anton Howes adds to Clark & Jacks’s observations in his arguments against Wrigley’s coal hypothesis. I particularly like Howes’s points 7 to 11. The coal hypothesis relies excessively on the importance of James Watt, but Watt’s inventions were not exogenous. One could make Watt endogenous in an “ordinary” way like Robert Allen. In that model Watt responded to a particular cost structure, viz., coal may have been cheap in England but the existing technology was also wasteful in coal usage, so there was an incentive to reduce its consumption. But even that does not explain, as Howes elaborates in the manner of Joel Mokyr, the prevalence and persistence of innovation across industries and across time in Britain and in Europe. There was a general air of innovativeness starting in the mid-18th century which can’t be explained just by reference to prices and costs alone. Howes’s observations echo some arguments made by Deirdre McCloskey in chapter 22 of Bourgeois Dignity, but I think he has better, more concrete examples. By the way the McCloskey book is full of arguments, chapter by chapter, which I endorse, although I’m not keen on her “bourgeois dignity” thesis itself. This entry was posted in cotton, cotton textiles, global history, historians of capitalism, Industrial Revolution, Slavery and tagged coal, cotton, counterfactual, Edward Baptist, historians of capitalism, Industrial Revolution, Slavery, Sven Beckert. Bookmark the permalink. 20 Responses to Was slavery necessary for the Industrial Revolution ? Did colonization make the extraction of Indian cotton more or less efficient? If Europe had been restricted to cotton picked by free American labor and a non-colonized India, could industrialization have still taken off? Hi Matt ! (You are the same Matt of yore, I assume ?) Well, Argentina, Egypt, and China were integrated into the European global order without formal colonisation, so my first thought is, de jure colonisation was not necessary. Also, before 1860, the British East India Company did not really interfere with traditional agriculture even though it marketed Indian cotton (raw and textiles) around the world. 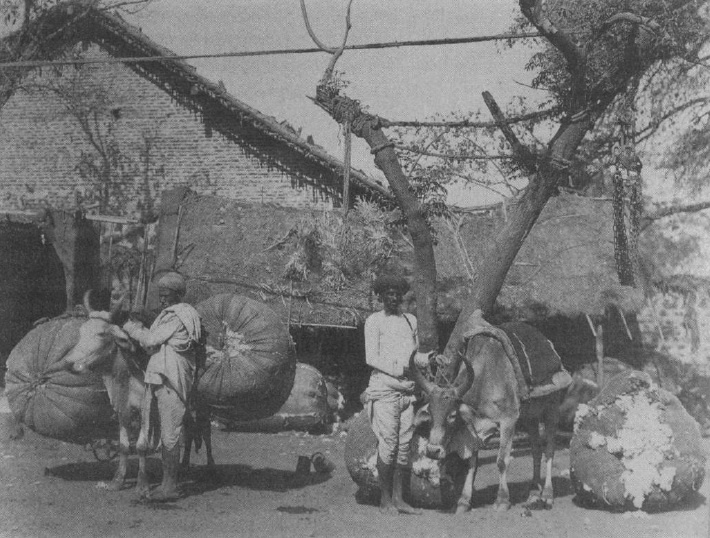 But after 1860, the pressure on production was greater and the British colonial administration transformed Indian cotton agriculture. It had been a supplemental crop for farmers growing staples but they were persuaded to become full-time cash producers. At the same time systems of rural credit and land deeds and so on were converted along British lines. I don’t know if that was possible without de jure colonisation and I don’t know if that would have been prerequisite to expansion of Indian output to make up for the American shortfall (in the hypothetical case of free labour). But what ever the case be, industrialisation still would not have been prevented. By ~1820 or 1830 Britain was producing surplus textile for export and that surplus required cheap and abundant cotton. But the function of the surplus was primarily to enable Britain to import its deficit in food production. If it had to grow more of its own food it might have slowed down industrialisation but not prevented it. I think. It might have developed more like northern France, for example. There are some good arguments here. However, the people who support Baptist’s thesis might shift their case to the beginning stages of industrialization (late 18th and early 19th centuries), when the technological, institutional, and cultural edifices supporting industrialization in Britain were still weak or undeveloped. American slavery might have “greased the gears” of nascent British industrial production enough to let it get off the ground, and only in the later half of the 19th century, when the industrial economy had become powerful, could British industry withstand a large shortage of cotton. The US had strong cultural ties with Britain, was a longstanding and (mostly) trustworthy trade partner, had excellent and cheap cotton (as you show here), and was near enough to keep transportation from being too difficult. Baptist’s defenders could argue that these things were essential in the beginning of industrialization, even if they became less so later on. Such an argument is a bit more difficult to counter, since it is less measurable and more difficult to counter-factualize. If you could rebut this thesis, however, your points here would become even stronger. I don’t think so. By 1800 the industrial revolution was clearly already in high gear in the qualitative-technological sense and it was only a matter of quantitative expansion. And the earlier you go in industrial revolution history, the less relevant American cotton becomes simply because Britain was much more reliant on other sources of cotton. In fact British exports to the American colonies in the 2nd half of the 18th century included (reexported) Indian cotton textiles as well as British cottons made with Indian fibre, though I don’t know about the proportions. There’s a big jump between 1790 and 1800 in the amount of raw cotton imported by Britain from the United States. That could be artificial because the American War of Independence might have interrupted the flow previously. BTW Indian finished textiles were still competitive with British textiles before 1800 within the UK. Outside the British market India remained competitive in international markets until about 1830, when British textiles became cheap enough to be competitive within India on a large scale. Rainfall not distributed properly in time. and moisture did not match the demands of cotton plant; when the weather was hot and useful for cotton growth, there was less moisture; and when the plant had grown sufficiently, the humidity led to more pests. As such, there was never a situation where Indian cotton could compare in prices with southern US (ran started early in summer) or even Egyptian cotton. Of course, now the situation is not relevant now that we are manmade fibre dominant; depedndng on the relative prices of cotton and man made fibre, we can always mix and match. The answer to your question is, an attempt was made by the B. empire to dislodge Ameruican; but that attempt was not successful. I wonder though, in your version of the events the UK still dominates india thus giving the proponents of the “west is only rich because it exploited the rest” faith the argument that “ok then the evil white men would have industrialized by exploiting India and not black slaves”. THus the question would be if the dozens of native and Muslim Indian princes ruling the subcontinent before the British could have established such a cotton production to satesfie the demands of Britains flegling industry. Could the west have industrialized without colonies at all? We know that the Egyptian native government did realize the benifits of growing cotton as a cash crop and Im sure that some indian rulers would have too, the question is would there have been enough such rulers and would they have been able to grow it effectivly enough. Well, technically this whole post was unnecessary because cotton textiles, per se, were not necessary to English industrialisation. No single sector was so important that its absence would have checked the industrial revolution. But it was fun to go through an alternate history of cotton supply. Just curious — what if cotton itself had never existed? Do you think the Industrial Revolution would still have happened in Europe? I find it hard to believe it all could have rested on a fiber used mainly for clothing, whatever its economic importance. Is there any reason to think that Europeans, rather than going naked, couldn’t have simply continued making due with linen and wool, and gone on to invent steamships and the rest anyway? Hmmm… I asked whether you thought cotton was necessary to the Industrial Revolution, and checking back now I see the question had already been answered in a comment dated Jan 9. I may have missed that comment, but I could swear it wasn’t there at the time I posted mine, and that in fact there were only five comments posted at the time. Odd. Isn’t this a moot point since slavery did happen? How can you extract points of history? Historical events are fixed in time and lay upon one another. Are you saying that the transatlantic slave trade did not have an economic benefit for Europe? You mean to tell me that the infusion of cash that comes from free labor had no impact and added no fuel for the industrial revolution. What is the point of this? What is your larger goal?